It has been some time since I have posted, so I thought I needed to update the blog before we all lose interest. I have been busy working on the relentless task of painting five battalions of Victrix French, but more about that later. I have also been working on my terrain table. I have got the oak side pieces fastened in place and now the table certainly has a finished look. Additionally, the modules are all nice and tight in place. 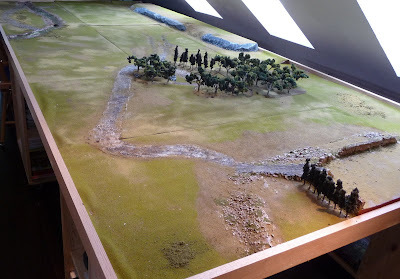 I have build six 2x4' pieces and five 1x4' pieces as outlined below: Brown hills, grey roads and blue rivers. The roads were quite a challenge as the pieces are not geomorphic, so there was no easy way except by trial and error to arrange the positioning of the roads. It was, in fact, quite a nightmare. 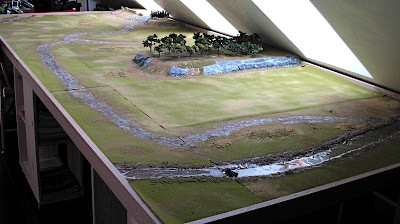 I think if I was going to do it again I would have liked to have used uniform sized terrain modules, but of course that was impossible as the largest table I could fit in was 12x5'. 12x6' would have been perfect as each module could have been 3x3'. Smarter fellows (Garage-Gamer), than me have already worked this out. C'est la vie!! Not withstanding the above, I was able to come up with several layouts. Here was my first, it was designed for use for my FoB scenario Engagement at Ventosa. Do not mind the trees on the ridge, I had to find somewhere to place them. 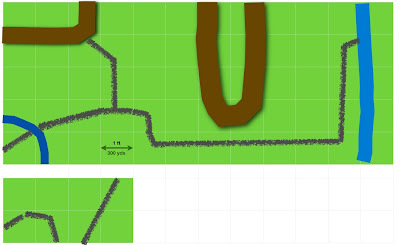 Here is another layout, fortunately the terrain went together better than my little diagrammes. You will notice that the stretch of road going from the bend in the river in module C is missing, I can't get everything done (but I am working on it)!! Forest used to link gap in road. This layout went together pretty well. Overall, I am quite pleased with the table and the modules. There are quite a few possibilities for different scenario setups. Thanks ArtDoro, great photos on your blog. That certainly is terrain to drool over, John. I really need to look into getting a used ping-pong table and foam board, and start doing a bit of landscape engineering myself! Nice blog old chap. I was just wondering about your Portugese troops. Are they just Britishers with a paint conversion? They look very handsome. Hi Robert, I finding working on terrain very relaxing, it is highly recommended. The portuguese infantry are portuguese Front Rank, the artillerymen are converted Redoubt. Very nice indeed! Your terrain is some of the best I've seen John. Thanks, Iannick, I have seen better but it does look ok.